Our banana leaf coffins are available in a traditional coffin shape or round-ended shape. They are available as an option for all funerals that we arrange, and also for sale for delivery within the UK. These coffins are popular for woodland burial as they are entirely bio-degradeable and from a sustainable resource. Appropriate for burial or cremation. Made from flexible but strong banana cord, which is woven around a natural cane and light rattan framework, giving the whole product even more stability. Guaranteed to carry a weight of up to 23 stone. Appropriate for cremation and burial. Available in a range of sizes. Certified for quality by the FFMA (Fairtrade Furniture Manufacturers Association) and/or CCSA (Coffin, Casket and Shroud Association). All our eco-coffins are suitable for traditional, green burial or green cremation. 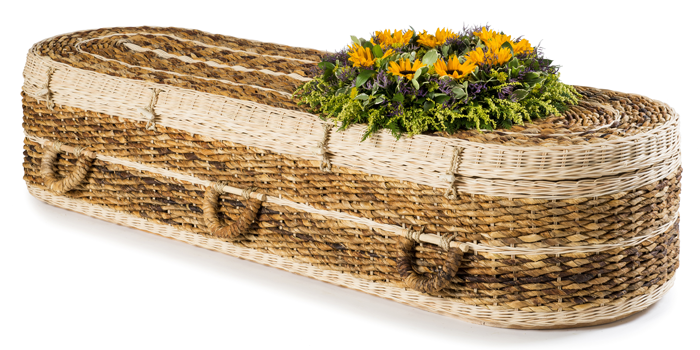 Other natural coffins available are crafted from; bamboo, cane, cardboard, willow/wicker, pandanus, seagrass, and wool. All prices include natural coffin liners, and delivery within mainland UK. There is no additional VAT. These banana leaf coffins are made from sustainable resources; they are 100% natural and biodegradable. Quick delivery. If you order before noon (Monday to Friday) we aim to deliver it within 48 hours. Deliveries are only Mondays to Fridays not weekends. Deliveries are only in mainland UK. Deliveries to the north of Scotland may take a little longer. Please note that the coffin that you receive may not match the colour exactly of the coffin displayed on screen. They are natural materials therefore tone may vary harvest to harvest. Also your computer monitor may have different colour settings to ours. Cemeteries and Crematoriums require that the coffin is identified with a nameplate. We can have a bamboo nameplate engraved for you for 90p per letter. Alternatively you could print one off your computer on cardboard or even paint or draw one as long as it has the person’s legal name on it. This can be applied with double sided tape or tied on with ribbons. All prices include natural coffin liners and delivery within mainland UK. There is no vat. No flowers are included. Just call us anytime Monday to Friday 8am-6pm on 0161 969 6690 to place your order. Your payment details (credit or debit card, bank transfer, or cheque). Payment for your order can be done with credit or debit card, cheque or by bank transfer. For use of credit cards there is a 2% additional charge.